This is Kristin Korb’s first album. Not possessed with an especially powerful set of vocal chords, Korb nonetheless weaves delicate figures with a clear, cool, almost vibrato-less voice. Scatting, but not to the point where lyrics are entirely ignored, she’s a pleasant, if not overwhelming, addition to the world of jazz vocals. 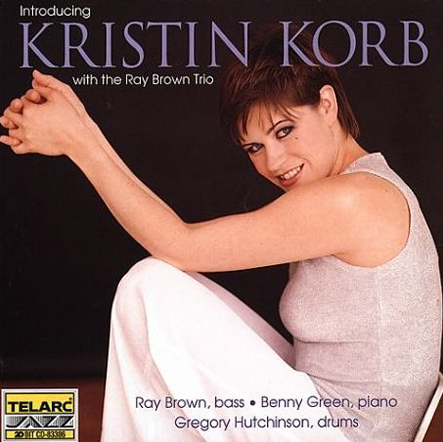 Korb is joined on this session by the dean of bass players, Ray Brown, and his trio that features the outstanding, hard driving piano player Benny Green, an outstanding soloist in his own right. The trio is augmented by two veterans, Plas Johnson on tenor sax and Conte Candoli on trumpet. Johnson, unfairly, is pretty much known for his work on Henry Mancini’s Pink Panther. He has done much more and better work, such as with T-Bone Walker, Lou Rawls, and others. His swinging, boppish sax drives “Yeh Yeh.” Conte Candoli has been on so many albums, he’s likely lost count, but he hasn’t lost his touch of waxing lyrically behind a singer in the tradition of fellow Stan Kenton player, Don Fagerquist. Guest guitarist, the Brazilian Oscar Castro-Neves, takes center stage in Latin-tinged tunes like Luis Bonfa’s “Black Orpheus.” “Peel Me a Grape” is done, appropriately, in an Anita O’Day style and there’s a very delicately delivered “These Foolish Things” and an almost hymn-like “Take the “A” Train.” These slower tunes are balanced by a winging version of Neal Hefti’s “Whirlybird.” A nice program of varied tunes offered by top professionals provides a little more than 45 minutes of pleasant entertainment.